This elegant metal cube invites you to separate the two halves. However it is not as easy as it might appear. All four sides have an identical looking dovetail joint, which would suggest that separating the two halves is impossible!This is a great puzzle for trying out on your friends, or maybe having on your desk, to challenge visitors to your office! On the one hand, this looks like an 'impossible object' since it is not immediately obvious how the two pieces come apart. But there is more to this puzzles that that. When you initially present this puzzle to someone, there is no sliding, pulling or twisting movement they can perform that will separate the two halves. The solution is not hard - but only when you know how! Most people will struggle to solve it. Until you show them...Machined from solid aluminium, this is a very beautiful piece of engineering. 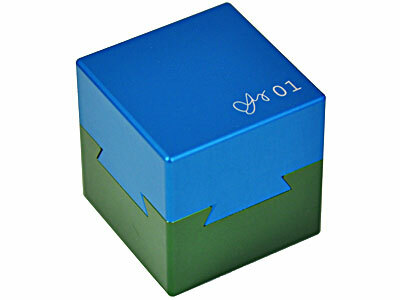 The cube is 40x40x40mm and weights 200g. The three Dovetail Cubes have similar but not identical solutions. Casse tGte unique et tr? ?s esth?tique. Un peu cher mais introuvable ailleurs. Love the cube. Beautiful machining, and just fun to play with. Good craftsmanship, but poor puzzle design. We discovered the blocking magnet mechanism by pure luck; had we not, the puzzle would have been unusable. Well done, but a little bit too expensive.